Secret Pizza Party @ Quail Ridge Books | What is ML Reading? It’s the day after Thanksgiving. I usually avoid stores of any type on this day. I worked a few too many Black Fridays at a toy store. However, I had to go shopping today. Adam Rubin was signing books at Quail Ridge Books. He’s one of our new favorite authors. Sadly, while he was in Raleigh from New York, ML was in New York. I can’t tell you much about Secret Pizza Party because it’s a secret. But I can tell you, I know a preschool boy who thinks it is the best book of the century. It’s not everyday you get to meet an author and his mom. But today I had the pleasure. Adam’s mom lives in Raleigh. She is planning a gala fundraising event at Marbles Kids Museum this spring to benefit Girl Rising, a nonprofit group campaigning for girls’ education around the world. I don’t know many details but I should soon. For all my Raleigh readers, I’ll let you know more closer to the event. 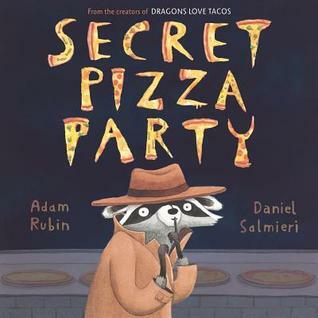 This entry was posted in Picture Book and tagged Adam Rubin, Big Bad Bubble, Dragons Love Tacos, Girl Rising, Marbles Kid Museum, Marbles Kids Museum, Quail Ridge Books, Secret Pizza Party by mlreads. Bookmark the permalink.